October 21, 2013 in Personal Stories. 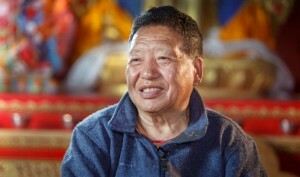 I am shocked and shattered to know that Choje Akong Tulku Rinpoche has passed away at the hands of murderers in Chengdu on 8th of October along with his nephew and driver. I feel so helpless and lonely without his strong and courageous presence. I knew Akong Rinpoche since I was 9 years old. He bathed me when I was dirty and nursed me when I was sick. He has been a most reliable and constant friend all my life. He was also the first to invite me to come to the West to teach. Akong Rinpoche was a man of few words and he always did what he said. I never saw him sitting idle even for a short period and he was always doing something worthwhile. But he never looked stressed or tense. He was on the high throne in his most expensive brocade one moment and the next moment he was digging a ditch in the rain with same ease and naturalness. I do not need to talk about his contribution towards the preservation and spread of Buddhism nor do I have to inform about his charitable works. These are well known to the whole world and whole Tibet is now remembering him for his gigantic work in so many projects. He taught us that to help the helpless is the essence of Dharma practice as well as our human responsibility. We will always miss him but I hope his mission would never come to suffer because of his absence. I would like to pray for his swift return and to continue to help countless people who need dedicated and fearless people like him. Yes it was very shocking to hear this news of the terrible actions in Chengdu. My husband Paul and I spent many periods of time at Samye Ling, seeing for first hand the way Akong Tulku held everything together, his fairness and his calm, overseeing his flock, monks, nuns and laypeople. Many who came to Samye Ling had been, or were still, troubled and they were given a haven, to rest and ‘come around’ – to join in with the activities of the monastery when they felt ready to. I think this was the attribute of akong Tulku I admired most, that and his humility – whilst not appearing falsely ‘humble’. We also had teachings from Ringu Tulku at Samye Ling, and to him and Akong tulku’s brother, Lama Yeshe, who has a huge task ahead in his time of sadness, we extend the very best of our wishes.